With the commissioning of Lethem 95.1 FM yesterday, residents of that community would be able to listen live to what is happening during the Golden Jubilee celebrations in Georgetown. 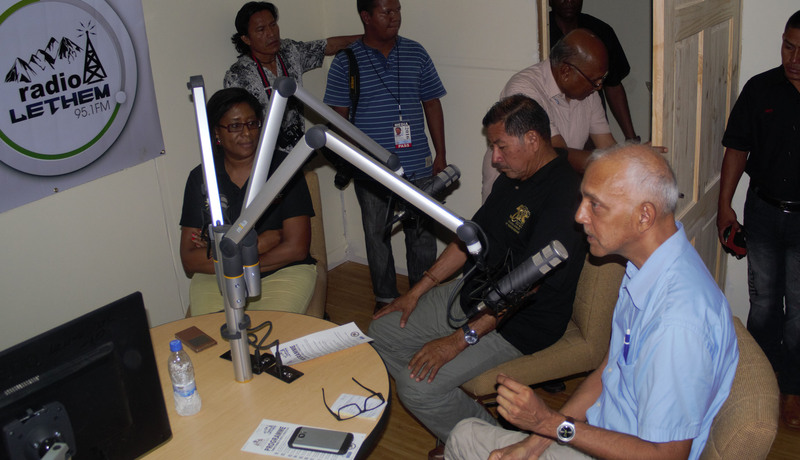 Minister of Communities, Ronald Bulkan speaking on the first radio programme after the launch, along with Minister of Indigenous People’s Affairs, Sydney Allicock (centre) and Minister of Public Communications, Cathy Hughes. 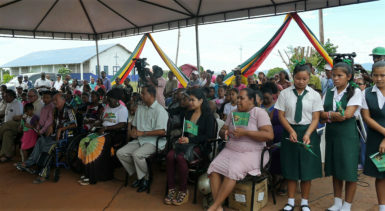 Prime Minister, Moses Nagamootoo who travelled to Region 9 for the commissioning of the radio station, which would be transmitting through the state-owned National Communications Network (NCN), said it was a promise in the APNU+AFC manifesto to bring broadcasting to the hinterland and was happy that it was ready in time for the jubilee. He welcomed the mayor of Bon Fim, Lisete Spies to the occasion and thank the people of the community for supporting the radio station, which would give them the opportunity to put forward their own ideas. Regional chairman, Bryan Allicock said it was an historic day for the people of Region 9 and that he has gotten a request from residents of the neighbouring Bon Fim in Brazil to broadcast in Portuguese. He told them that it was management’s decision and he would be in touch with them. Prime Minister, Moses Nagamootoo (left) launching Radio Lethem 95.1 FM before the start of the programme yesterday. Also in photo are coordinator of the project, Rovin Deodat (second from left), Minister of Indigenous People’s Affairs, Sydney Allicock, Minister of Public Communications, Cathy Hughes and Minister of Communities, Ronald Bulkan. The chairman hopes that it doesn’t end with radio and would be lobbying to have a television station, “where the entire region into the Karasabai sub-district, into Deep South, into the far north would be receiving the station.” He hopes that the Prime Minister would see that request is realized. The radio station which has a range of 25 miles and on a clear day, up to 35 miles, would not only serve the people of Lethem but other nearby villages, such as Nappi and St. Ignatius. Residents in the Deep South, which is about 100 miles away would not be able to access the signal. The project got started after veteran broadcaster Rovin Deodat, who is now the coordinator, met with Nagamootoo nine months ago and discussed the concept of community-oriented radio. Another radio station is slated to be commissioned in Mabaruma within the next few weeks. He said they were trying to “tweak the system so that you can have television as well.” He noted that they have already received signals for the Learning Channel, which is being transmitted to 16 locations in the country via satellite. “We owe it as a duty to the young people that they would be able to receive wider communication and access the wider world through radio and television,” he said. Twenty young people from the community joined the NCN team as volunteer broadcasters and reporters and were trained by Deodat, along with NCN’s Michella Abraham. The training was conducted through a grant by the United Nations Education, Scientific and Cultural Organisation (UNESCO). The volunteers were grateful to Minister of Communication, Cathy Hughes who promised to donate 15 laptops so that they can get their work done professionally. He urged them to think about their natural resources and their beautiful landscape and biodiversity and the many wonderful things that can be done in their region. According to him, in 1998 he had the pleasure of commissioning the first FM radio station in Guyana; 98.1 Hot FM, when he served as Minister of Information. 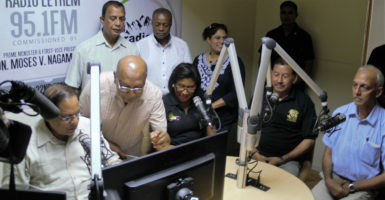 He mentioned that Deodat had been along that journey in the broadcasting landscape when he [Nagamootoo] produced the first broadcasting policy for Guyana in 1993. According to Nagamootoo, Azeez was “crippled by an assassin’s bullet… he was shot at pointblank range” a day after he and other members of the “Muslim faith” had pledged their support to him before the last general elections while he was a prime ministerial candidate. “I understand the case has become cold, but I would make it a hot case like the hot FM,” he promised. The PM said that before becoming a lawyer, he wrote four versions of what became the broadcasting act. That act, he said, identified broadcasting principle as the vehicle to unite the Guyanese people. “If you can’t spread the word of unity, then you can’t achieve the objective of unity. The only way to spread the word is to be able to communicate with all the communities of Guyana – from the coast to the hinterland, to the border areas…” the Prime Minister said. He recalled that he was able to access a transmitter and the studio was built to set up radio for the University of Guyana (UG). But after he left office, the project was never pursued. Meanwhile, Nagamootoo said that mobile governance was recently taken to the people of Rupununi where they were able to access land without traveling to Georgetown. He said, too, that during the recent drought, Minister of Indigenous People’s Affairs, Sydney Allicock led a team into the Deep South and had reported to cabinet two weeks ago that 11 wells were being dug with help from Brazil. Three of the wells have already been drilled and the others would be completed shortly. The wells would ensure that the Rupununi would not feel the blistering thirst if they experience another drought. And while the rainy season has started, he hopes that they have made preparations to deal with floods. He noted that it is not important which political party you came from, all the parties must be respected. The government and the opposition belong to a system of governance and we all have to work together.